Also talk about our plans after graduate. 23 years old after finish our degree, have to work hard to save money for building up a family. Is it enough for 5 years? RM30,000 for a wedding party and all the expenses? My goodness, an unbelievable number for us. Its not possible to survive for only one job unless the support from the parents. What if we do not have financial support from family? Still have to work hard by ourselves, right? "Pengsan"~~ And i think i also feel "paisei" to get money from them since i already 23 years old. Emm~ ok, back to our plan. Will targetted on those secondary school from Form 3 to Form 6. I think there were less competative instead of get the primary students. Haha.. Of course im not the one who in-charge on English subject. Most probably will in-charge on Add Math and Chinese or Science. Now is planning how to advertise and promo to those students. Maybe will through my secondary school and the schools which are near to my place since we have quite good relation with those teachers. Wahaha~~ This is another advantage which always went back to our schools during some special days like teachers day or other festivals, Hari Raya or Chinese New Year. Hopofully the procedures for applying the license will not bring a lot trouble. Our company organised 2 public trainings on 20 & 21 April in KK - Interpersonal Leadership and Communication Skills & Sikap Kerja Positif. Im in-charged on one of the program, Sikap Kerja Positif. A motivation talk which is build up their confidence, positive thinking and so on. Another good trainer, Mr Rajan Anthony. Not only can learn the process to do well in an event, and yet get a lot of knowledge from the trainer and see the problems which the participants are facing at their workplaces. There are real world experience which we cant get from the books or theories. Learn to be a good HR person in monitoring those people in a company. Appreciated the opportunity for me to attend and involve in these 2 days training programs. Went to KK for organised 2 public training programmes at Hyatt Regency Hotel. Well, actually didnt have much time for shopping even though the clothes, shoes and many things are much cheaper than Kuching. Haha~ So, just stayed at hotel to enjoy the services like spa, jacuzzi and sauna. Overall service is excellent and facilities provided are adequate. The lunch was excellent with a good variety to chose from, my favourite desserts, cakes... and salad. Quite ok the trip. Haha~ will come to this place in the near future. Thinking about my job, my plan... and the business. All are running in my mind! First, How to get more potential customers for our consultative programs? Second, plan to open another tuition centre with coorperate with my friends who are interested to join me. Looking for the market and the relevant location. Hopefully everything will be on running. Actually started tuition for quite a long time but not very good response for the registration, maybe not enough for the promotion? So, i decided to postpone my plan and join to another tuition centre for part time teacher. And now, there are few of my friends who are finished their study, I think maybe can have another try to get more students and start our new tuition class. Haha... Even i have lots of problem in English but i am very good in Math, Chinese and Science. Jobless is another issue which are facing by my fellows friends recently. Em.. At the moment, actually its not necessary we strict to look for the job which only match to our course! Maybe can try in another way? I think that will not make ourselves in frustrating and suffering. From the different background of company, we will get differrent experience and knowledge. That is how i survived in my jobbing life these few years... Haha! Thats also how i gain my experince. Anyway, all the best to you all and hope to see you get your good journey in the coming days. Ok, Mountain Singei which there is a church at the half hill. And there are a lot of stairs for us to reach the church. Actually is "stairs climbing"... haha! Long time didn't update my blog... Emmm... really a busy life! And yet, there are a lot of admin works which have to be done before we go off to KK next monday. Most probably have to stay back for OT tomorrow if everything is still not ready. 2 programmes will run concurrently on tuesday and wednesday and another consultative programme would be run in KL on Friday and Saturday. Have been doing on those topics of Training Programs. Spent two days on that already, just realize that how tough of those success marketers. How to package our service or product to be marketable and sellable? Im still weak on my English and this make me harder to find a relevant and right word to capture the objective of the programs. That’s what Im learning now… Word hard on this now! Proposed some programs to the clients according to their requirements, and now waiting for their feedback! This is the first project which involved by me and Hui Phing. But Hui Phing is putting much more afford on that as I still in-charge on other tasks. I do believe this is what my superiors are teaching on me, be confidence and you will overcome all the negative feelings. Yes, I did it. I can share with them about our services, our trainers, and our programs. Not bad… haha! Maybe this is still not enough and nothing to be proud for others, but I am really happy and grateful to have this improvement. A big thank to my superiors and Prof who advised me very much in propose my programs’ topic. Went for a meeting with my friends which involved in IT production of software. A good opportunity for me to gain more money, to learn more IT knowledge which bring a lot advantages to me in my workplace, maybe in future? Who knows? IT is getting important and treated as a skill which our generation supposed to know although we are not major or talented in IT. By the way, i will still stay with my company, Adroit. It was the place for me to grow, to improve. And yet, Im hoping to go for the conference, campaign, exhibition with it. There are a lot of spaces for us to expand. Willingness, and one thing... Brain Wave! Ever heard this before? Read a book which is regarding this topic. It really works and i believe it really works. Not only my salaries got increased in this month, May. There are a lot of opportunies also pop out since my willingness and desire is stronger from days to days. And my dreams seem is near to me from days to days. Informed by my colleague regarding the campaign at Spring in kuching. Been there for two days after my work. A very nice experienced event. You may also drop by to have a look before it ended by this Sunday (04-May 2008). 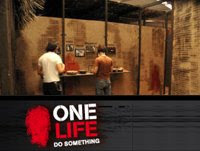 ONE LIFE REVOLUTION - Do Something! One Life Revolution (OLR) a campaign jointly collaborated between World Vision, Malaysian CARE and Malaysian AIDS Council. This unique walk-through experiential exhibit enables visitors to put themselves in the shoes of three children who had endured extraordinary hardships because of HIV/AIDS and trafficking. It is an interactive, personal audio-visual journey that lasts approximately 20 minutes. OLR is basically a public awareness and advocacy campaign. The exhibit aims to raise awareness of the plight of children affected by HIV/AIDS and child trafficking. Wake up early like usual this morning, Mom asked me: Where are you going today? Why dont continue your sleep since you have not enough sleep these few weeks? I said: Go to office... She replied: Are you crazy? Today is Labor Day, you should rest at home! I know she is worried about me, but i still have to go bacause i need to complete my works there instead of waste my time at home and doing nothing. Haha... Im still Ok! So... Dont worry, mom!